Many small parrots like cockatiels, parakeets, and parrotlets, are ground feeders. That means a good amount of their daily food are seeds. Many of the seeds they eat in nature are germinated. When seeds germinate (soak up/absorb humidity) they get ready to provide the necessary boost of nutrition for a plant to develop and grow. All of this nutrition is awakened when the seeds are soaked or germinated. 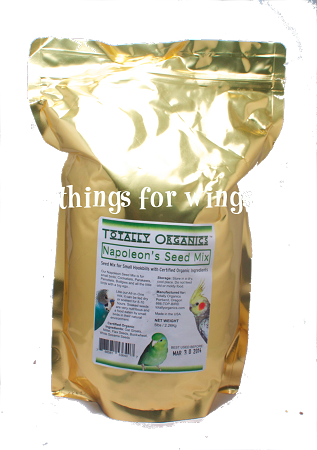 Soak Napoleon’s Seed Mix and it releases this nutrition to the birds. Organic Oat Groats, Organic Hulled Millet, Organic Flax Seeds, Organic Sesame Seeds and Organic Buckwheat.